We sampled low temperature hydrothermal fluids at the Dorado Outcrop utilizing discrete sample collection devices with the DSV Alvin and autonomous time-series samplers (OsmoSampler) deployed with RSV Jason II. These fluids exhibit small chemical changes in composition relative to ambient sea water, but nevertheless suggest that there are low-temperature chemical processes occurring within the ocean crust that influence sea water chemistry. For example, the sampled fluids are enriched in dissolved inorganic carbon (DIC) by ~0.05 - 0.10 mM and have a carbon isotope signature that is lower than the surrounding bottom seawater. This change in the DIC is consistent with the observed changes in fluid alkalinity. Assuming that the measured DIC enrichment is representative of global low temperature hydrothermal systems, the magnitude of the DIC source would be 0.5 – 1 x 1012 mol C/y, which is roughly the same magnitude as the high temperature hydrothermal source, but is more than a factor of three smaller than the estimated rate of carbon removal via carbonate precipitation within the ocean crust. The dissolved nitrate concentration in discrete fluid samples has a value of 38 ± 1 µM, which is indistinguishable from bottom seawater and implies that there is little nitrification or denitrification occurring within the hydrothermal fluid reservoir, and by inference, little cycling of organic carbon. Based on an isotope balance that considers added sources of both inorganic (basaltic glass) and organic carbon, the DIC net carbon isotope signature of discharging fluids form Dorado Outcrop is most consistent with a primary carbon source from seawater (96.3%), plus a component from the weathering of basaltic glass (2.8%), and a minor component from organic matter degradation (0.9%). The inferred importance of inorganic processes at Dorado is consistent with other chemical measurements, most notably phosphorus, calcium, and silicon, and is likely driven by the rapid fluid flow and short fluid residence time between the fluid source and discharge sites. 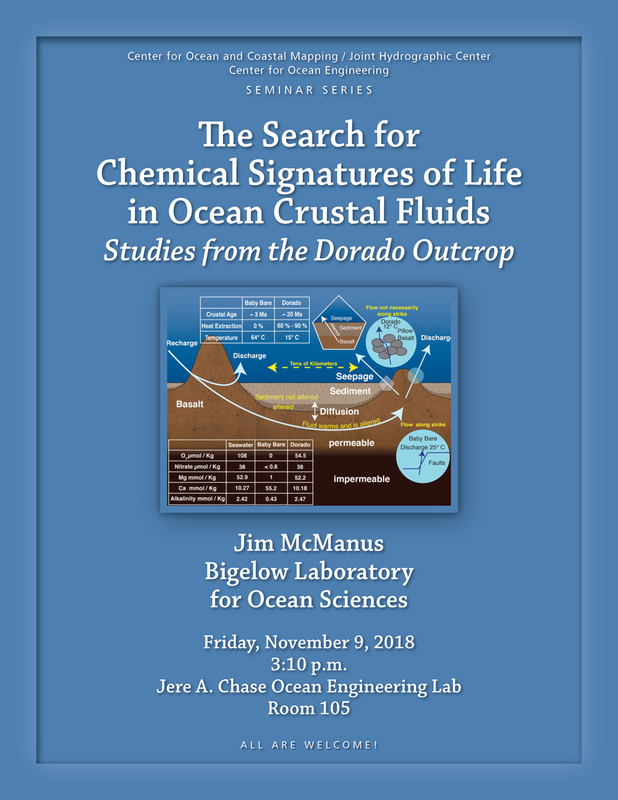 Jim McManus joined Bigelow Laboratory for Ocean Sciences as a Senior Research Scientist and Vice President for Strategy and Administration in the summer of 2016. He received his B.S. degree in chemistry from Stockton State College (1986) and his Ph.D. in oceanography from Oregon State University (1992). He held postdoctoral appointments at the University of Southern California and Oregon State University and was an Assistant Professor at the University of Minnesota Duluth and the Large Lakes observatory from 1998 to 2002. He then returned to Oregon State University until 2013. He moved to the University of Akron as Department Chair in the Department of Geosciences in 2013. He also spent one year at the National Science Foundation in the Chemical Oceanography Program as an Associate Program Director (2008 - 2009).